In Power View you can sort a table or matrix to display your data in the order you want. You can instantly reorder your data by sorting the table or matrix on any of its columns (except image columns). Note: If you are sorting in Power View in SharePoint, you must be in Editing Mode. In the table or matrix you want to sort, click Edit Report in the upper left of the report area. In the table or matrix, click the column headings you want to sort. You see an up or down arrow next to the heading showing that the field is sorted in ascending or descending order. Click the arrow to reverse the sort order. You can sort text, numbers, dates, and times. You cannot sort image columns. 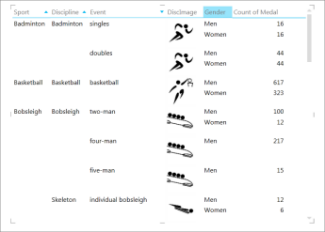 Notice there are no arrows next to Gender or Count of Medal. Gender is using its default sort order, alphabetical. Count of Medal, a value field, is not being sorted in this view. In matrices, you can sort the whole matrix on one numeric column, or sort the matrix on one non-numeric column in each grouping level. 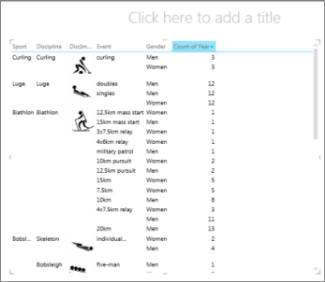 Suppose you have a matrix grouped by Sport, with Discipline, Event, and Year Count columns. 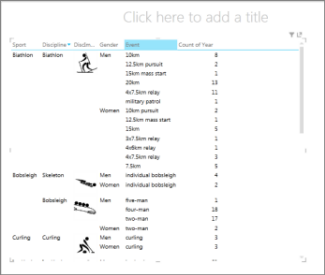 You can sort by just the Year Count column or you can sort by one or more of the other 3 fields (Sport, Discipline, Event) based on the order they appear in the matrix. Note: In a flat table, you can only sort on one column at a time. The matrix below is sorted by Count of Year. If you sort by the count of the years the event has been played, the matrix is sorted from the Sport with the most years played to the least years played. And within Sport, Discipline is also sorted from the most years to the least years, and then alphabetical for Disciplines with matching totals. And this matrix is sorted by Discipline.